Richmond Bartender Challenge: Kale Salad | Food and Drink | Style Weekly - Richmond, VA local news, arts, and events. We challenged Kabana Rooftop’s bartender, Nasim Malik Saifullah, to make a salad you’d like to sip at cocktail hour. Scott Elmquist It was a tough challenge, but bartender Nasim Saifullah nailed the kale salad cocktail. The first sip is a complete surprise. 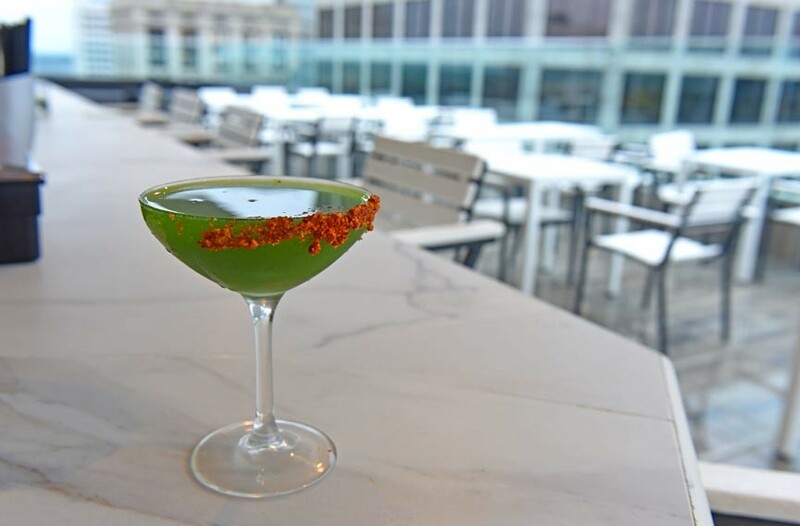 I sit at the bar at Kabana Rooftop, and the green drink before me has my full attention. I'm not even thinking about the spectacular view behind me. 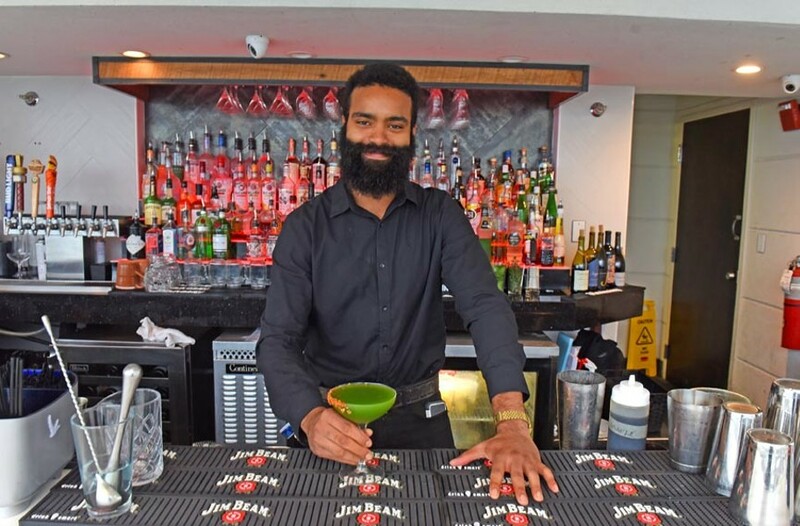 Bartender Nasim Malik Saifullah smiles widely behind his beard. He nailed it. The challenge was to create a drink based on kale salad. I was dubious — kale isn't exactly the most introverted green. I was hoping for something palatable, but that was about it. Saifullah's first hurdle to overcome? "Not going too crazy with my imagination," he says. "Trying to stay true and keeping it simple." He spent three or four hours in the kitchen just getting the kale-based juice right. Initial batches were too viscous, and he had to strain — and strain and strain the juice some more — before it had the feel and the taste he was looking for. "It was a learning curve," he says. It didn't help that at one point someone threw out his fine-tuned quart container of juice because they thought the vivid green liquid was something that had gone bad. But before the juice came the liquor. "I wanted something that played well with mescal," he says. To provide the backdrop for the smokiness of the spirit, he created a balanced blend of kale, cucumber, ginger and lemon juice. A rinse of Ancho Reyes sharpens the ginger, and a rim of crushed nuts hints at the cocktail's salad-based inspiration. The result is an unexpectedly bright drink that sparks with spice without overpowering the vegetable base. Yet it isn't a particularly vegetal cocktail — instead, it's a cool sipper anchored by the mescal's deep flavor. Saifullah's concoction isn't exactly healthful — what cocktail is? — but it has the legs to make you forget that maybe a few vitamins and flavonoids are hitching a ride. Crush a handful of walnuts and spread them in an even layer on a small plate. Rinse a coupe glass with the Ancho Reyes, and then carefully press the rim of the glass in the walnuts. Shake the mescal, juice and agave together in a cocktail shaker and carefully pour the drink into the glass. Run the kale, lemon, cucumber and a small knob of ginger through an extraction juicer. Start conservatively with the ginger — you can always add more later. Stretch a couple of layers of cheesecloth across a large bowl and strain. You'll need to do this a couple of times more to achieve a thin consistency that will make this more of a cocktail than a glass of vegetable juice with liquor. Stir in the simple syrup and refrigerate. Correction: This article originally misspelled Nasim Malik Saifullah's name. It has been corrected.